Judaism, Christianity and Islam all share the concept of divine revelation being sent down by God for the benefit and guidance of mankind. Islam acknowledges the scripture that was revealed to Moses, the Tawrah, as well as the scripture that revealed to Jesus, the Injeel. These are often translated as ‘Torah’ and ‘Gospel’, respectively. The Qur’an also acknowledges the scriptures revealed to other prophets, such as Abraham and David. Where Islam differs is the question of whether the versions of the Bible which exist today are the same divine revelation that was bestowed upon Moses, Jesus, and other prophets. The aim of this article is not to prove that modern Bibles are corrupted texts. Rather, it is to discuss the different opinions that exist with regard to how the original Tawrah and Injeel relate to Bibles that exist today. We will also clarify the correct Islamic position in this regard. The Bible of today is the very same Tawrah and Injeel that were revealed to Moses and Jesus. The Bible of today is a mixture of truth, corruption and revelation. The Bible of today contains some truth but no revelation whatsoever. 1. The Bible of today is the very same Torah and Injeel that were revealed to Moses and Jesus. This position is quite a popular polemic among Christian apologists. To substantiate this claim they must resort to twisting and misinterpreting verses of the Qur’an and prophetic narrations in the ahadith. The aim is to try and convince Muslims that the Bible we have today is a 100% divinely revealed text, and therefore Muslims must blindly accept what it has to say. Here Ibn Abbas is saying that the traits and descriptions of Prophet Muhammad ﷺ were changed in the Book. This is a position that is supported by the Biblical textual criticism of mainstream Jewish and Christian scholarship. Here the Qur’an tells us that if it contained internal inconsistency, then it cannot be from Allah. The point is that contradiction is a product of human infallibility, and obviously not what we would expect of the All-Wise and All-Knowing Creator. The Bible is not only internally contradictory, but it also contradicts the Qur’an on fundamental issues of Islamic creed. By this Qur’anic standard then, the Bible has, at least for those parts that are contradictory, been tampered with by man. In summary, to claim that Islam endorses the Bible of today as a 100% divinely revealed text is completely incorrect. 2. The Bible of today is a mixture of truth, corruption and revelation. This position is the understanding that the Bibles of today are a mixture of truth, corruption and revelation. As we will see, it is the position that best explains the collective verses of the Qur’an, ahadith, and the statements of the companions. It is important to point out that the Bibles of today cannot be equated with those scriptures that were originally revealed to Moses and Jesus. That is to say, the Old Testament does not equal the Tawrah, and the New Testament does not equal the Injeel. That clarifies what the Bible is not. We will now go into detail about what the Bible is, from an Islamic perspective. When it is said that the Bible contains truth, what I mean is that there are verses which are factually correct in what they’re saying, even though they may not originate in revelation. One example is the wisdom sayings found in books like Proverbs. In addition to truthful verses, there are also corrupted verses. Corruption can be intentional or unintentional. An example of intentional corruption is the story of Abraham where the son of sacrifice was changed from Ishmael to Isaac. Unintentional corruption is when verses undergo accidental changes during the copying process, such as missing words or spelling mistakes. The third category is those verses that are divine in origin. These are remnants of revelation from the original Tawrah and Injeel that can be found within the numerous versions of the modern Bible. The Qur’an’s quotation of Jesus is found in Mark’s quotation of Jesus and this shows that this particular verse of the Bible has an origin in revelation. We can see that the wording between the Qur’an and New Testament in the verses above is slightly different. What we do have is a portion of the Bible that originates in the teachings of Jesus and then later on was transmitted to us in meaning (in an altered form in translation). The only way we can know that these are the words of Jesus is because the Qur’an confirms it. Not only does this confirm the words of Jesus, by extension it also confirms the Shema of the Old Testament which Jesus was quoting: “Hear O Israel, the Lord is our God, the Lord is One” [Deuteronomy 6:4]. What’s interesting is that Paul is quoting some other scripture that has preceded him, as he says “as it is written”. Nowhere can we find such a statement in the Old Testament, however something very similar can be found in the apocryphal book the Gospel of Thomas: “Jesus said: ‘I will give you what no eye has seen and what no ear has heard and what no hand has touched and what has not entered into the heart of man’” [Gospel of Thomas, saying 17]. It’s quite interesting that the Gospel of Thomas attributes this teaching directly to Jesus. So here we have the perfect example of a remnant of some genuine revelation discussing elements of the unseen that has been preserved in the modern Bible and the apocrypha. This confirms that it is a punishment ordained by Allah, as confirmed by the Prophet and Abdullah bin Salam, and alluded to by the Qur’anic revelation sent down in response over the incident. But nowhere do we find anything in the Old Testament about the need for four witnesses or an analogy about eyeliner. This reinforces the idea of remnants of revelation being within the Bible, the ruling has been preserved but in modified form. Here Jesus is relating to his disciples a prophecy about the coming kingdom of God on earth. We can see that the Bible matches what the Qur’an is saying about many of the events of the end of the world. How did this knowledge come to the author of the Gospel of Matthew, did they make numerous lucky guesses? Since this is knowledge that relates to the unseen, then by definition it must be divine in origin. Muhammad bin Ishaq mentioned the reason why this Surah was revealed. He said that an old man from among the people of Egypt who came to them some forty-odd years ago told him, from Ikrimah that Ibn Abbas said: “The Quraysh sent An-Nadr bin Al-Harith and Uqbah bin Abi Mu’it to the Jewish rabbis in Al-Madinah, and told them: ‘Ask them (the rabbis) about Muhammad, and describe him to them, and tell them what he is saying. They are the people of the first Book, and they have more knowledge of the Prophets than we do.’ So they set out and when they reached Al-Madinah, they asked the Jewish rabbis about the Messenger of Allah. They described him to them and told them some of what he had said. They said, ‘You are the people of the Tawrah and we have come to you so that you can tell us about this companion of ours.’ They (the rabbis) said, ‘Ask him about three things which we will tell you to ask, and if he answers them then he is a Prophet who has been sent (by Allah); if he does not, then he is saying things that are not true, in which case how you will deal with him will be up to you. Ask him about some young men in ancient times, what was their story For theirs is a strange and wondrous tale. Ask him about a man who travelled a great deal and reached the east and the west of the earth. What was his story And ask him about the Ruh (soul or spirit) — what is it If he tells you about these things, then he is a Prophet, so follow him, but if he does not tell you, then he is a man who is making things up, so deal with him as you see fit.’ So An-Nadr and ‘Uqbah left and came back to the Quraysh, and said: ‘O people of Quraysh, we have come to you with a decisive solution which will put an end to the problem between you and Muhammad. The Jewish rabbis told us to ask him about some matters,’ and they told the Quraysh what they were. Then they came to the Messenger of Allah and said, ‘O Muhammad, tell us,’ and they asked him about the things they had been told to ask. The Messenger of Allah said (I will tell you tomorrow about what you have asked me) but he did not say ‘If Allah wills.’ So they went away, and the Messenger of Allah stayed for fifteen days without any revelation from Allah concerning that, and Jibril, peace be upon him, did not come to him either. The people of Makkah started to doubt him, and said, ‘Muhammad promised to tell us the next day, and now fifteen days have gone by and he has not told us anything in response to the questions we asked.’ The Messenger of Allah felt sad because of the delay in revelation, and was grieved by what the people of Makkah were saying about him. Then Jibril came to him from Allah with the Surah about the companions of Al-Kahf, which also contained a rebuke for feeling sad about the idolators. As these three questions and the stories concerned the history of the Christians and the Jews, and were unknown in Hijaz at the time, hence they were used by the pagan Arabs to test whether the Prophet Muhammad ﷺ possessed knowledge of the unseen. We can see that many of the details found in The Youths of Ephesus match the Qur’anic account. While the Qur’an does not provide a date for when this event happened, The Youths of Ephesus does mention the evil king Decius who reigned in the third century. So whether these stories are divine in origin or not depends on whether this incident about the sleepers in the cave was known at the time the authors penned the original works. If these are just stories that were recorded after the event of the sleepers in the cave, then they are nothing more than historical truths that have been documented and handed down. If, however, these texts pre-date the incident of the sleepers in the cave then it is knowledge of the unseen which makes it divine in origin by definition. In which case, we have a situation where revelation has made its way even into texts that Jews and Christians consider apocryphal. Judaism as a religion is based not only upon the Old Testament but also upon the Rabbinic tradition of the Talmud. Whereas the Old Testament is the written law that Moses received directly from God, the Talmud is believed to contain the oral law that has been passed down from generation to generation. The purpose of this example is to show that even the Talmud contains some teachings that are divine in origin. In this case it has not been preserved in scripture but rather the traditions of the Rabbis. Such stories about Prophet Abraham are by definition divine in origin, as they relate to the unseen. The events that they narrate took place in the ancient past, long before the Children of Israel were sent Prophets and revelation. We can see in the Old Testament, the Israelites say, “we hear and we obey”, which is “shama‘nu wa asinu” in Hebrew. The Qur’an seems to mirror this with its use of very similar sounding Arabic verbs to turn this very phrase on its head. The Qur’an mentions “sami’na wa asayna”, or “we hear and we disobey”. This use of language demonstrates a deep knowledge of Hebrew, and is just one example of the masterful rhetoric that the Qur’an is capable of. The purpose of this example is not to prove that this portion of the Old Testament is revelation, but rather to demonstrate how the Qur’an engages directly with the Hebrew of the Old Testament and makes theological points using it. The “lawless one” is a reference to the Anti-Christ, the false Messiah who the Prophet Muhammad ﷺ called Dajjal. Paul obviously did not pluck this very specific detail about the breath of Jesus out of thin air. He must have had access to some of the authentic teachings of Jesus about the end of the world. This is yet another example where knowledge of the unseen, in this case our origin as human beings, has been preserved in the Bible. We can see that when we compare the ahadith and teachings that have been attributed to Jesus, the similarity is uncanny. The style of speaking is similar, as are the use of analogies. These are similarities that go beyond chance and coincidence. We can be confident that at least some of the words of Jesus have been preserved in translation in modern Bibles. How the companions of the Prophet Muhammad ﷺ could have come to know of this prophecy in the Jewish scriptures is an interesting question. The most probable answer is that they came to know about them from the Jewish converts to Islam, especially Rabbis such as Abdullah ibn Salaam and Ka’ab Al Ahbar  who were leading scholars of the Torah at the time of the Prophet Muhammad ﷺ. In looking at the Qur’an, ahadith and statements of the companions, we’ve established that modern Bibles contain revelation. This is beyond reasonable doubt, as the examples that we’ve looked at include knowledge of the unseen, such as information about the hereafter and future prophecies. These are so accurate, as confirmed by Islamic sources, and so numerous that they defy chance and coincidence. Knowledge of the unseen, especially, must originate from Allah as this is a special type of knowledge that only He possesses; so these verses are divine in origin by their very definition. This can no longer be considered revelation in wording, because in translating the verse into English we have obviously changed the words. What has been preserved is the meaning, which is still revelation as it represents knowledge of the unseen about Hell. To make this distinction between wording and meaning clear, let’s take the Sunnah as an example. Both the Qur’an and Sunnah are considered divine revelation; however, it is essential to note that there is a big difference between the Sunnah and the Qur’an. The Qur’an is revelation that is the verbatim speech of Allah, transmitted to us word for word. The Sunnah is the sayings of the Prophet, as conveyed to us by his companions, and can be transmitted in two forms –lafdhi (verbatim) or ma’anawi (meaning). With the former, the companions memorised the statements of the Prophet and conveyed them to us word for word, without any variation. With the latter, the companions paraphrased his words but captured their essential meaning. This is why we find different companions describing the same events or same speech of the Prophet ﷺ in variant wording. It’s why the companions would often end their narrations by saying “he said something like this”, because they conveyed the meaning in many instances and but not always the exact wording of the Prophet ﷺ. For example, Abu Umar Al-Shaybani reported that he sat with Ibn Mas’ud who would tremble when he narrated from the Prophet ﷺ. He used to add the words “…or something similar to this” or “words to that effect” . Here the companion Ikramah said something similar at the end of the narration: “Rafi’ b. Khadij reported that Allah’s Messenger came to Medina and the people had been grafting the trees. He said: ‘What are you doing?’ They said: ‘We are grafting them,’ whereupon he said: ‘It may perhaps be good for you if you do not do that,’ so they abandoned this practice (and the date-palms) began to yield less fruit. They made a mention of it (to the Holy Prophet), whereupon he said: ‘I am a human being, so when I command you about a thing pertaining to religion, do accept it, and when I command you about a thing out of my personal opinion, keep it in mind that I am a human being.’ Ikrima reported that he said something like this” . The important point is that when it comes to the Sunnah, the different forms of authentic ahadith, both those in wording and in meaning, are considered to be revelation. Let’s now apply this principle to the Bible. What is the nature of its revelation? We lack written records of the original revelation given to Moses and Jesus. We also have the issue of modern Bibles being based on ancient manuscripts written in the languages of Hebrew and Greek, and as such we can’t say with certainty that they contain revelation in wording as we don’t know which languages the original Tawrah and Injeel were revealed in. What we can say with certainty is that modern Bibles contain the meaning of some revelation, for those portions that are affirmed by the Qur’an and authentic ahadith. Those portions that have an origin in revelation are similar to ahadith that are transmitted in meaning. One contention raised is that the Bible as a whole is more analogous to fabricated ahadith. It is claimed that since modern Bibles suffer from a number of serious textual issues, such as corruption, unknown authorship and the lack of chains of transmission going directly back to the Prophets, therefore we must treat the entire Bible corpus in the same way that we would fabricated ahadith. So, in the same way that we would never say that fabricated ahadith contain revelation we also should not do so for the Bible. It’s true that the Bible contains fabrications, of which there are many; this is an undeniable fact and even the stance of Christian scholars. Now with regards to comparing the Bible to fabricated hadith, this is an incorrect analogy. A fabricated hadith must have a chain. Any text without a chain doesn’t qualify to be a hadith, fabricated or otherwise. In the science of hadith, strictly speaking, a text without a chain is not a hadith, it is not even considered as a candidate. What is a fabricated hadith? It is a lie against the Prophet ﷺ. When a hadith is fabricated, that means the matn, the content, is actually a lie. So there is no comparison between a fabricated hadith and the prophetic verses of the Bible, because as we’ve seen there are biblical verses that are backed by Islamic sources. These cannot be classified as fabrications because the Qur’an and authentic ahadith ‘own’ them, which elevates them in status and confirms they are divine in origin. Such verses of the Bible, strictly speaking, may lack chains of transmission, but in actual fact have the strongest possible backing – the Qur’an and Sunnah. Another contention raised is that the Qur’an and ahadith quote portions of the Tawrah and Injeel that cannot be found anywhere in modern Bibles, and this therefore proves that modern Bibles are not the same as the Tawrah or Injeel that existed in seventh century Arabia. We’ve already highlighted instances of variants in the examples analysed, where certain details are completely missing in the Bible or slightly different. 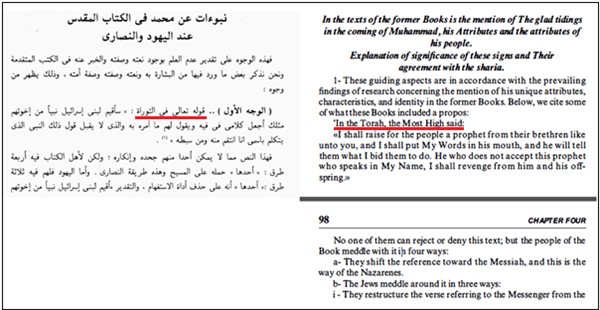 But does this prove that Bibles of today bear no resemblance to the original Tawrah and Injeel? This conclusion does not logically follow for a number of reasons. Firstly, it’s a fallacy to say that because some of it is different, therefore everything is different. Secondly, we know from history and manuscript discoveries that variants of the Bible have existed through most of its recorded history. Virtually every manuscript discovery is of a variant nature, so for variants to have existed in seventh century Arabia is not unusual, it’s to be expected. Through history, some Jewish and Christian sects have had different canons, for example some Jewish groups rejected all but the first five books of the Old Testament and some Christian groups rejected the writings of Paul. Variants are one thing, but to say that a unique Torah or Injeel existed in seventh century Arabia, and to then claim that they bear no resemblance whatsoever to the Bible of today, is an entirely different matter. There is simply no physical evidence to support such an assertion. In fact, there are many pre-Islamic manuscript discoveries of the Old and New Testaments – such as the Dead Sea Scrolls, Codex Vaticanus and Codex Sinaiticus – that are very similar and form the basis of modern versions of the Bible. Thirdly, this contention is inconsistent. Since it postulates that divergence implies different texts, then the inverse must also hold true, convergence implies textual commonality. As can be seen above, the middle ground that is misused is oxygen. Although the first two premises are true, that both John and my dog need oxygen to survive, it doesn’t follow that John is my dog . From the point of view of information that is general in nature, this criticism is correct. For example, Allah states in the Qur’an that He created the world, and the Bible also states that God created the world, then it is true that we cannot conclude that the Bible verse originates from Allah. It could just be a general statement in the Bible that happens to coincide with the Qur’an. However, this criticism does not apply to the biblical examples of revelation that we have analysed, as they relate to aspects of the unseen. Knowledge of the unseen is a special category of knowledge that only Allah possesses. Such knowledge cannot be attributed to other than Allah. Now, if only one or two instances were present in the Bible, then it could be put down to a lucky guess or two. But the sheer number of instances that are present in the Bible, along with the details they provide, goes beyond chance and coincidence. Moreover, Allah and His messenger ﷺ proclaim, as a statement of fact, that these instances are present in the scriptures of the People of the Book. These are proclamations that are general in nature, unless evidence is brought forward to prove otherwise, so by default they encompass the Bibles of today. Therefore, we can be certain that the Bibles of today contain content that is divine in origin, and indeed we have found this to be the case. Allah and His messenger ﷺ have certainly spoken the truth. Be acknowledged that these Scriptures [of Jews and Christians] are unreliable because we consider them corrupted and changed. Yes, alteration have not involved them entirely, but reached them after all. That is why our Prophet Muhammad (peace be upon him) said: ((Do not believe the People of the Book and do not deny them. Say: “We believe in Allah and what has been revealed to us and what has been revealed to you. Our God and your God is One, and to Him we have submitted.”)). He prohibited believing them for fear of that they may tell us something that is definitely corrupted, and disbelieving them for fear of that it may be not corrupted . 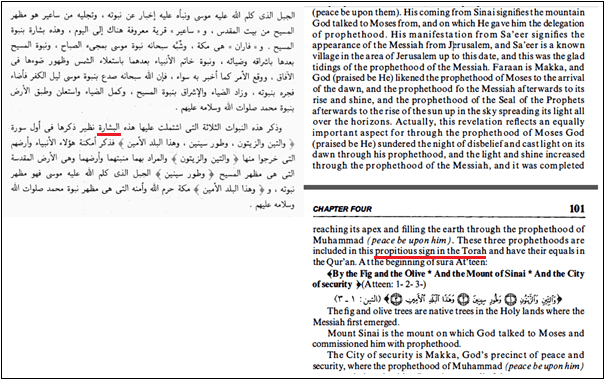 Remnants of the true Injeel, such as the prophecies of Jesus about Muhammad. Verses that are true but not necessarily remnants of the true Injeel. For example, he fully accepted verses such as Luke 4:24 where Jesus says “Truly I tell you, no prophet is accepted in his hometown”. He described it as a part of the Injeel that God protected and kept as a testimony against Christians . The criteria by which Ibn Hazm judged between the real Injeel and falsehood is the Islamic sources – he accepted what is consistent rejected what is incompatible e.g. by contradiction . Any portion that is neither sanctioned nor discredited could be true or false and Muslims should neither believe nor disbelieve . He believed that the Injeel has been lost except for a few portions . It’s important to acknowledge that there is not a consensus on the status of the Bible. Other classical Muslim scholars held very different views on this matter. But these opinions by the likes of Ibn Taymiyyah, Sulaiman ibn Abdul-Qawi al-Tufi , Ibn Hazm and Ibnul Qayyim, who were all giants in comparative religion, carry weight because they had a deep insight into the Bible. 3. The Bible of today contains some truth but no revelation whatsoever. This position claims that while modern versions of the Bible contain some truth, such as biographical information about the Prophets and other historical events, we cannot say, with any degree of certainty, that divine revelation can be found within. So, not a single verse can be considered revelation, in any sense of the word, because they cannot be linked back to Allah or His divinely inspired Prophets. What should we make of this position, especially in light of the numerous Bible verses we’ve analysed which contain detailed and accurate knowledge of the unseen? These verses obviously did not come into the Bible randomly, as this is a special type of knowledge that belongs to Allah, so it is divine in origin by its very definition. To attribute such knowledge to other than Allah and His divinely inspired Prophets, for example by saying that they are merely truths written by normal people, is a very serious matter indeed. The only way to try and get around this problem is to acknowledge that while such knowledge of the unseen is divine in origin, it must still be called “truth” and not “revelation” because it has undergone change in wording. In other words, for this position to distinguish between truth and revelation must mean that the wording has changed to the extent that it can no longer be called “revelation”, but enough of the essential meaning has been preserved such that it can be called “truth”. Is this valid reasoning? To illustrate why it’s incorrect to dichotomise truth and revelation when it comes to the entire Bible, we will look at the Sunnah. If one takes this methodology, which is the concept that change to the wording of a text necessitates that the text loses its divine status, and we extend it by applying it to the Sunnah, then we will run into some serious problems. How has the Sunnah been preserved and conveyed to us? Via the authentic ahadith, which are considered to contain revelation. Recall that earlier we discussed the fact that not all of the authentic ahadith have reached us via the exact wording of the Prophet ﷺ. The ahadith have reached us in two forms, lafdhi (word by word) and ma’anawi (meaning). The majority of hadith literature is in fact ma’anawi. This is why we find different companions describing the same events or same speech of the Prophet ﷺ in variant wording. So, even authentic hadith reach us in variant wordings. For those who maintain that the Bible contains truth but not revelation by virtue of changed wording, this has serious implications. It implies that many authentic ahadith contain truth but not revelation, which is incorrect from an Islamic perspective. We can conclude that a change in wording, in and of itself, does not result in a cessation of being revelation. The ahadith that convey the Sunnah to us in meaning are also revelation, for those that are authentic. For one to remain consistent then, those portions of the Bible backed by Islamic sources must also be considered to be revelation in meaning. To reduce the Bible to mere “truth”, is to be inconsistent, and inconsistency is a sign of a flawed methodology. 4. We have already seen numerous Qur’anic verses, ahadith and statements of the companions which reference verses of the Tawrah, statements of Jesus, prophecies about the coming of Muhammad ﷺ, and aspects of the unseen; all of which can be found in modern versions of the Bible. The Bible of today is a mixture of truth, corruption and verses that originate in revelation. The Bible of today contains some truth but no remnants of revelation. We’ve seen that the first position is the weakest of all. The third position, that the Bible of today is bereft of all revelation is not only un-Islamic, but it also goes against all known textual evidence of the Bible. Although this stance is more correct than the first, it is still highly problematic. It is the second position – that Bibles of today are a mixture of truth, corruption and revelation – that is a middle path between the other two extremes. The Qur’an, authentic ahadith, and statements of the companions bring to our attention the fact that the scriptures of the People of the Book contain revelation. We have used the Qur’an, Sunnah and companions to identify which portions of the Bible contain revelation in meaning. An analysis of modern Bibles shows that there are numerous examples of knowledge of the unseen which is divine in origin by its very nature. Such content, especially the declarations about the hereafter, Day of Judgement and Dajjal, goes beyond chance and coincidence. We’ve also seen that this view is backed by many classical Muslim scholars, giants in the field of comparative religion who had deep knowledge of the Bible. We’ve seen that on one hand, Islam teaches that the scriptures of the People of the Book have become corrupted. On the other hand, we have also seen verses and ahadith which refer to the scriptures in the possession of Jews and Christians by their divinely revealed names of the Tawrah and Injeel. For the other positions, these polarised statements are problematic as they cannot be easily reconciled. However, with the nuanced approach that this article recommends, we have no such issues as it best explains all the collective evidence. Any mention of corruption of the scriptures of the People of the Book can be a reference to those portions of modern Bibles that are not divine in origin but rather man-made lies. Any reference to the Tawrah or Injeel can be a reference to those portions of modern Bibles which are revelation in meaning. Thus the collective Qur’anic verses and ahadith which were previously problematic are now harmonious, and there is no need to resort to mental gymnastics, odd tafasir or even conspiracy theories about hidden manuscripts in order to reconcile them. Furthermore, this nuanced approach is robust, reflects the reality of the Bible manuscript discoveries and respects the opinions of the classical Muslim scholars who were most informed on this topic. 4 – Sunan Abu Dawud, Hadith no. 3862, Source. Sheikh Albani declared this hadith authentic in Sunan Abu Dawud, hadith no.4452. 7 – The Assumption of Moses, chapter 9. 8 – Mishnah Sanhedrin 4:5. 9 – Midrash Rabbah on Gen. xv. 7. 18 – Sunan Abu Dawud, Book 3, Number 1041. 22 – Narrated by al-Tabaraani in al-Kabeer, 486. Shaykh al-Albaani said in Saheeh al-Jaami’, 5045, that this hadeeth is saheeh. 29 – Al-Dhahabi, Tadhkirah Al-Huffadh Vol.1 p. 15. 31 – Explanation of this fallacy taken from Hamza Tzortzis article “DOES THE QUR’AN CONTAIN SCIENTIFIC MIRACLES? A NEW APPROACH ON HOW TO RECONCILE AND DISCUSS SCIENCE IN THE QUR’AN”. 32 – Al-Jawab As-Sahih, vol. 1 p. 367, also vol. 2 p. 16. 33 – Ibn Kathir, Al-Bidayah wa Al-Nihayah, Volume 2, pp. 152-153. 34 – Ibn Taymiyyah, Answering those who altered the religion of Jesus Christ, pp. 334-335. 35 – Lejla Demiri, Muslim Exegesis of the Bible in Medieval Cairo, p. 74. 36 – Sulaiman ibn Abdul-Qawi al-Tufi, Al-Intesarat Al-Islamiyyah, 1/230-232. 37 – Dr. Muhammad M. Abu Laylah, The Qur’an and the Gospels, pp. 128-130. 39 – Dr. Muhammad M. Abu Laylah, The Qur’an and the Gospels, p. 128. 40 – Ibid, p. 135. 42 – Ibnul Qayyim, Guidance to the uncertain in Reply to the Jews and Christians, p. 90. 43 – Ibid, p. 93. 46 – Abu ‘Abdullah al-Qurtubi, Tasfir al Jami’ li-ahkam al-Qur’an, Commentary on Surah 5:43. This was badly needed. Too many strawmen built upon “position one.” Does my head in. I agree with Abu Talha’s comment. This is a much needed and very well written and researched scholarly article. I hope it will get wide circulation and be well read by anyone who is interested in the subject matter. Very interesting reading. This kind of subjects needs to be read with a clear mind and a special mood. 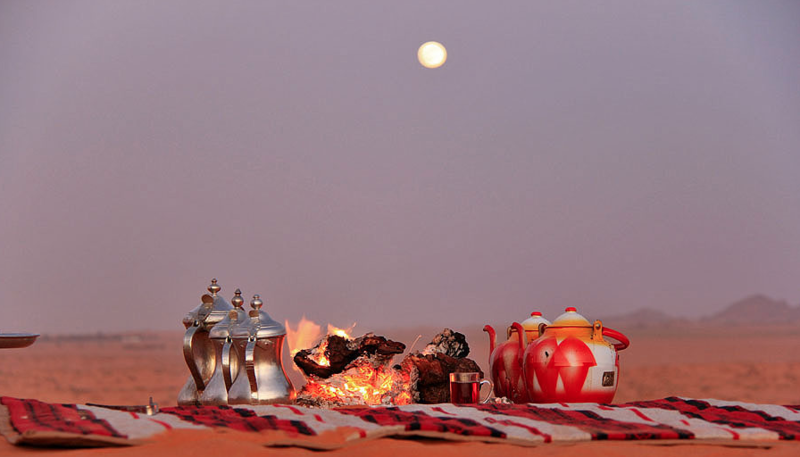 For me, Arabian coffee will do! I will join you and I will bring the knaffey!! I did not appreciate this. I refuse to call that passage to be “inspired”! I will not call a forgery inspired. And no Paul most likely did not write that (2 Thessalonians). In reading that it seems to imply that the author is NOT calling 2 Thessalonians inspired, just that it contains a piece of something that was inspired previously. He seems to be saying that whoever wrote 2 Thessalonians (Paul or an unknown author who produced a forgery) drew some content from a prior text, (however far removed from the original source) that may have retained some content which was originally received through divine inspiration. And thus, that tiny sliver of divine content was inserted or absorbed into the Biblical text – presumably through dumb luck on the part of the unknown author of Thessalonians. Notice in hadith about a specific blessed Hour in the Friday where Allah answers the prayers of muslims that Abu Hurirah was arguing with Ka’ab, a jew who converted to Islam, about. Ka’ab was saying that the Hour is only found in one Friday in the whole year, yet Abu Hurirah objected and corrected Ka’ab that the Hour is found in each Friday as prophet said. Then Ka’ab read the ( Torah) again to see, then he affirmed what Abu Hurirah had said. When Abu Hurirah went to Abdullah ibn Salaam, a jewish companion of the prophet who had converted to Islam, and told him the story, Abdullah ibn Salam affirmed that the ( Torah) mentioned that the Hour is found in each Friday of the year. The Q is ; which was the ( Torah) that Abdullah ibn Salaam & Ka’ab read because the “Torah” now doesn’t mention anything about that hour in Friday. I don’t want to give any conclusion, but when christians and jews keep saying that they know the bible even before Islam, we need as muslims to question this premise. https://onlinelibrary.wiley.com/doi/abs/10.1111/j.1478-1913.1925.tb00572.x is anybody heard of this?